If you need an accessibility solution for an outdoor staircase, we offer multiple outdoor stair lifts at a variety of price points. Choose a used outdoor stair lift for the lowest price, or get a deluxe model with higher weight capacity and an extra wide seat! Every outdoor stair lift is engineered for exterior installation and use, and includes a weatherproof cover to protect your lift from wind, rain, snow, ice, and other inclement weather that can damage crucial components. 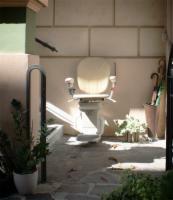 Call us now to order your outdoor stair lift!